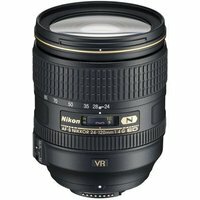 The Nikon 24-120mm f4 G AF-S ED VR Lens is a 5x zoom lens for FX format D-SLR photographers and features a fixed f/4 aperture throughout the zoom range. With a Nano Crystal coat to greatly reduce ghosting and flare, it has high optical performance, and Nikon's second generation VRII system is included to compensate for camera shake. The Nikon 24-120mm f4 G AF-S ED VR Lens offers excellent value and performance in a compact package for adventurous photographers everywhere.